Weston senior captain Brittany Swanson scored three goals, including the game-winner on Friday in a 10-9 home win over Brookfield. The Lady Trojans raised their record to 6-4 with the victory. The Weston girls lacrosse team held off a determined Brookfield squad, 10-9 on Friday at home and improved its record to 6--4. It was the Lady Trojan defense that shut the door on the Lady Bobcats in the final minutes of the contest. The game went back and forth with each team mounting scoring drives after falling behind. Weston senior captain Brittany Swanson scored the winning goal with just over eight minutes left and then the defense stepped up and shut down Brookfield. Weston opened up with a quick 3-1 lead on goals by junior Hannah Hutchins, sophomore Catie Ledwick and Swanson. The Lady Trojans controlled the faceoffs and ground balls in the first half and kept the ball in Brookfield's end for most of the half. Towards the end of the half, Brookfield made a run at the Lady Trojans and scored three goals to Weston's three and the Lady Trojans ended the half with a 6-4 lead. The Lady Bobcats came out of the intermission a team possessed after a goal by Kara Florimi. They scored three quick goals in three minutes and tied the game. Brookfield was awarded a direct shot and scored to claim an 8-7 lead, its first advantage of the game with 18;27 remaining. One minute later, Ledwick tied the game again for the Lady Trojans. Only 26 seconds later, sophomore Nichole DiCanio put the Lady Trojans up 9-8, but with 13:14 left, the Lady Bobcats came right back with a quick shot to tie it 9-9. Weston sophomore goalie Carolyn Figliola made some incredible saves late in the game and had 11 on the day. 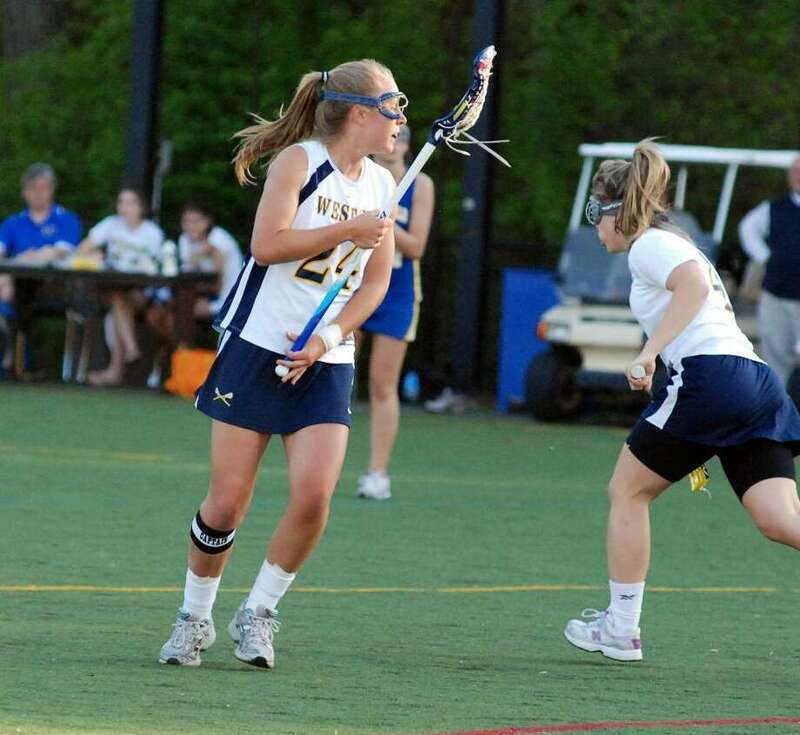 As Brookfield kept pressing on offense, Weston's defense and midfielders kept it at bay. With 8:13 left, Swanson scored her third goal of the day, which turned out to be the game-winner. Lady Trojans Coach Erin Wilson praised her team's tough defense. She said, "They were in a zone today. It was an exciting, but an agonizing ending." Both Hutchins (one goal) and Swanson felt their intensity was great. "We really stepped it up on defense today" Hutchins said. Swanson said, "We really played as a unit. We really wanted this game. We were intense all game long."